Where the arc of the North Circular declines, the road swerves south and dips steeply towards the Liffey by way of Infirmary Road. Straight ahead the Phoenix Park beckons, spreading its serene blanket of greenery on the western periphery of Dublin. Once remote, it is now a playground for its urban and suburban surrounds. Phoenix connotes birth from fire, or revolutionary rebirth, concepts not without echo in the park’s historical fabric. In fact, the name derives from the Irish Fionn Uisce, meaning clear water. This refers to the Liffey along the southern edge, where the waters run clear above the muddy waters of the tidal estuary. In Norman times, this was part of the demesne of the Knights Hospitalier based at their abbey south of the river at Kilmainham. The dissolution of the monasteries by Henry VIII in 1537 dispossessed the monks of their lands. At the Restoration more than a century later, Lord Lieutenant James Butler, the Duke of Ormond, established the lands as a royal hunting park. A herd of fallow deer was imported and is still in occupation. In 1680 the lands were split each side of the Liffey. The Royal Hospital was built at Kilmainham to cater for retired army soldiers and is now the Irish Museum of Modern Art. 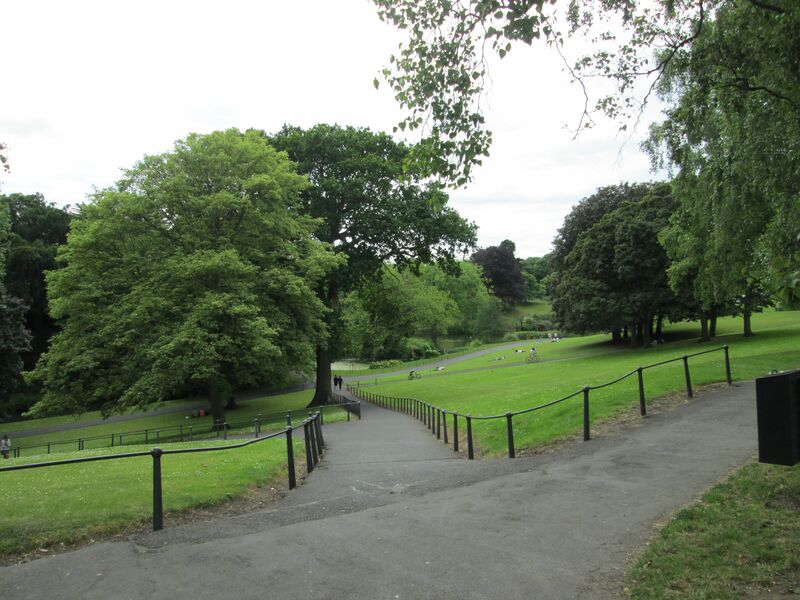 In 1745 the Phoenix Park became a public park, one thousand seven hundred and fifty acres enclosed by an eleven kilometre wall, reputed to be the largest urban park in Europe. It is twice the size of New York’s Central Park and more than four times the size of London’s Regent’s Park. The Park is a significant city thoroughfare. The main drag, Chesterfield Avenue, ascends in a neatly dividing diagonal between Conyngham Road and the Castleknock Gate. It bisects a vast expanse of manicured nature. There’s grassland and woodland, the brazen herd of deer, pitches for football, cricket and polo grounds, the dog pond for our four legged friend and the Zoo for more exotic critters There is a sprinkling of monuments and hidden amongst trees, some significant buildings. The Garda headquarters are to the right near the Park Gate, the NCR entrance. 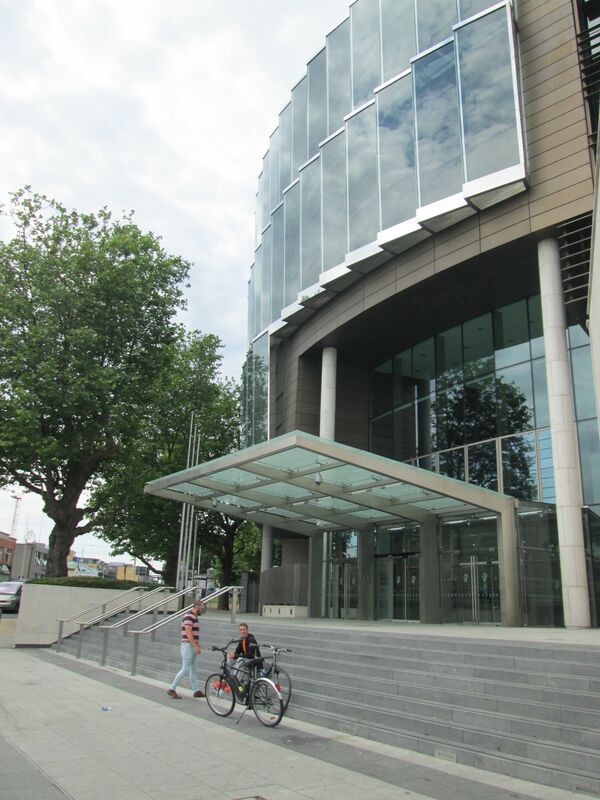 To the south is the Office of the Director of Public Prosecutions and the Criminal Courts of Justice. Not the best spot for loitering criminals so. Mind you, Bohemians Football Club was founded by a group of young men at the Gate Lodge in 1890. They’re the oldest soccer club in Ireland, and played their first games at the Polo Grounds. 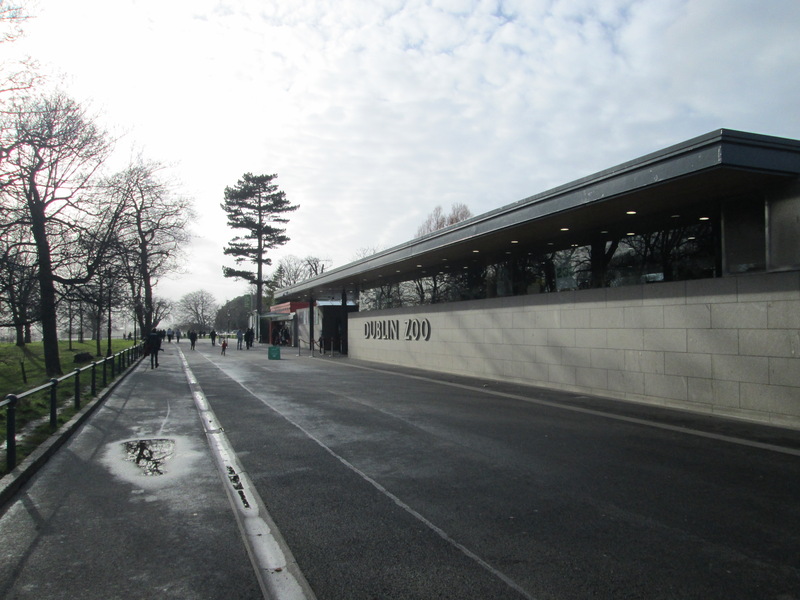 Dublin Zoo is nearby. 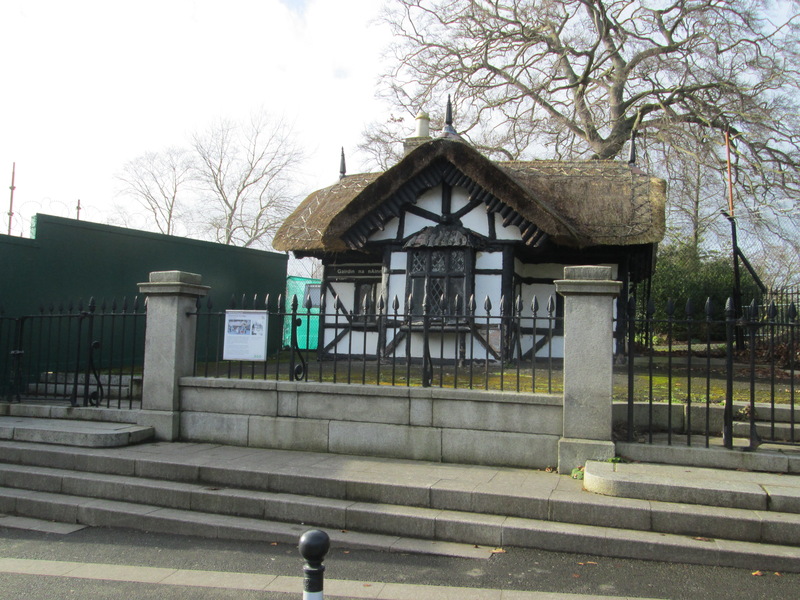 The quaint entry post survives, a charming thatch out of Africa and another era. The large modernist entrance is adjacent. The Zoo is picturesquely constructed around ornamental lakeland. A more enlightened policy these days gives the animals some room to roam. Monkeys and chimps have their islands, predator and prey of Serengeti and beyond have large outdoor compounds. The Zoo was opened in 1831 and quickly became a popular destination for Sunday day-trippers. Still is today. 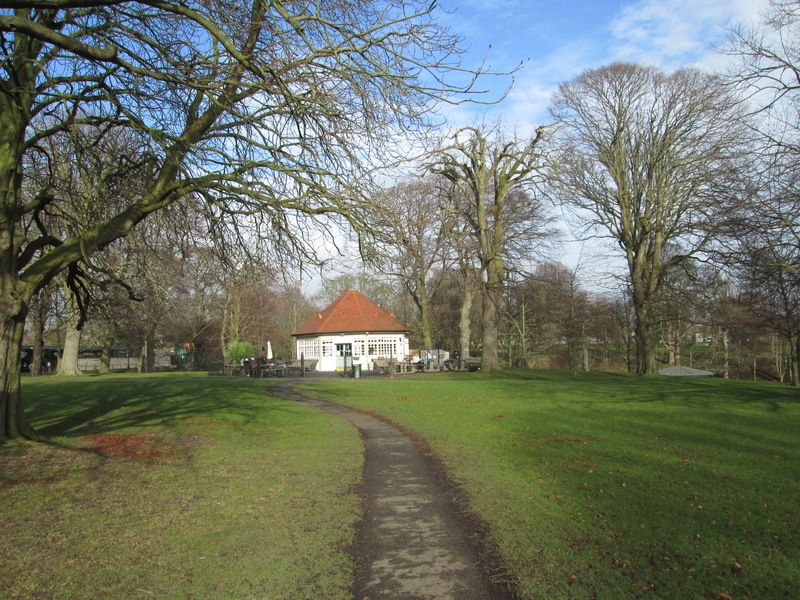 Nearby are the quaint circular tearooms. A place where I like to catch a coffee and lounge on its outdoor terrace. Of a morning in Spring or early summer a perfect moment is possible, with the air hanging like gauze from awakening trees. It’s busy today though, despite the wintry cold, and I pass on. The ground falls steeply away to the east, falling away towards the Hollow. The Hollow has long been an occasional outdoor music venue, whether for formal brass band or a bit of good old time rock and roll. 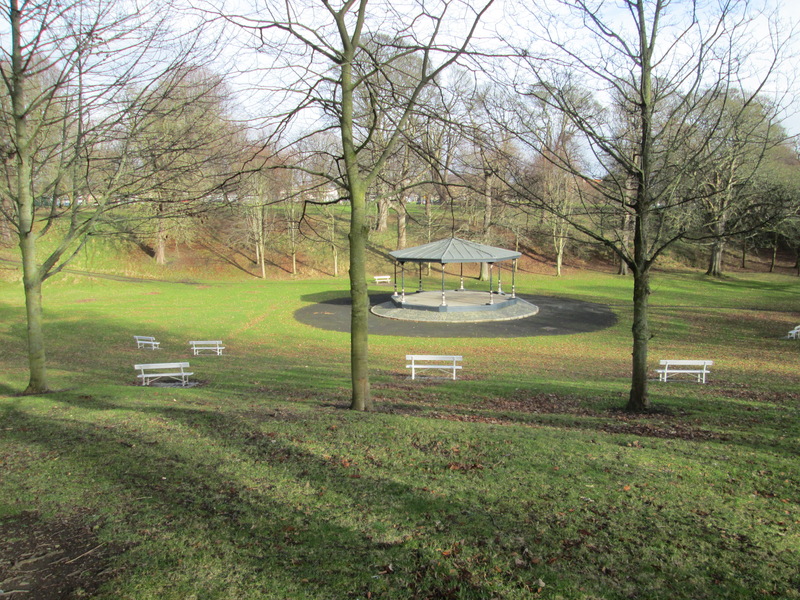 The ornate bandstand from 1890 provides the focus. I was a frequent flier in the mid seventies, with that hippy coterie and Mary Rose. I should namecheck the playlist, but then I smoked the green, green grass of home. The Park holds memories of greater gigs. They vary from the visit of Pope John Paul II in 1979 to the Red Hot Chilli Peppers some years later. The Pope attracted a million to his gig, the Chillies somewhat less; though they were rowdier and louder, including me and my teenage son, singing and sweating through a summer day. 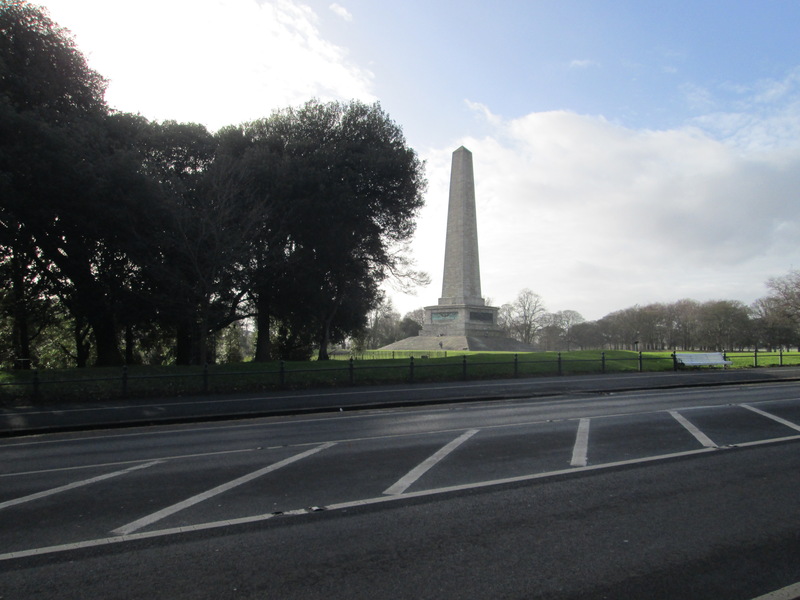 This quadrant of the Park is marked by the stone finger of the Wellington Monument. Crossing the main road there’s an iconic view of Dublin to your left. 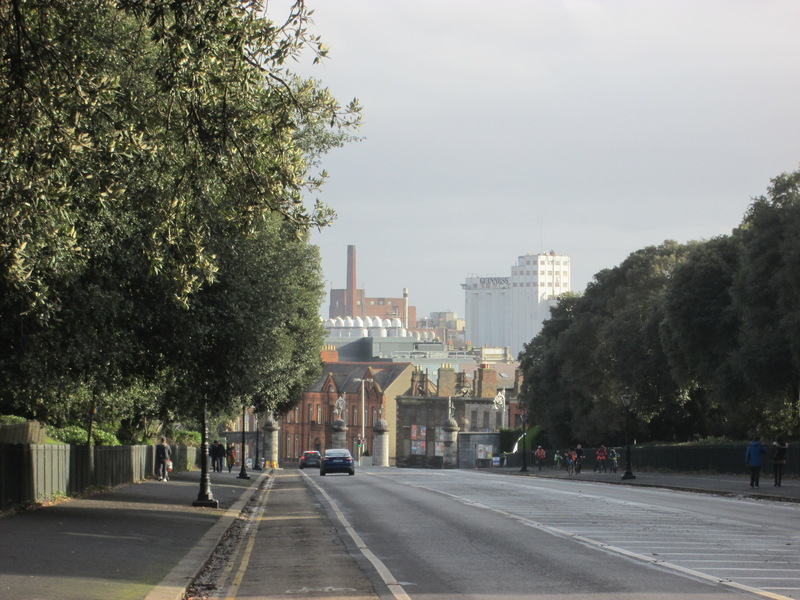 As the road falls towards the Parkgate Street entrance, the stacks and towers of the Guinness Brewery rise up with the city, a throbbing urban wall against the sublime greenery of the park. Off track to our right is Aras an Uachtaran, the residence of the Irish President. It was built in 1750 by the Chief Ranger, Nathaniel Clements. Clements was a property developer and politician, who lived in Henrietta Street, the first grand Georgian streetscape. The Aras, viewed across the lawns, is oddly resonant of the White House in Washington, although the resemblance is coincidental. Neo-classical architecture doesn’t vary all that much at first glance. Before Independence it was the Viceregal Lodge and witnessed one of those darker incidents that form a contrast to the Park’s bucolic idyll. In May 1882 the newly appointed Chief Secretary Lord Cavendish was walking in the vicinity with Under Secretary Thomas Burke when they were stabbed to death by two members of The Invincibles. The assassins were spirited away by getaway man James Fitzharris, more colourfully known as Skin the Goat. George Hodnett’s mock trad spoof, Monto, gives a scabrous and partial account. Cavendish had just replaced Forster, known as Buckshot for his hardline attitude to the Land League. He took his Mott and lost her up the Furry Glen. Forster resigned over Parnell’s release from Kilmainham Jail, and Cavendish’s first day in the post proved to be his last. After the outrage, Carey, leader of the Invincibles ratted out the perpetrators, but paid a high price when assassinated on a ship out of Cape Town. They stand up for their principles, day and night. 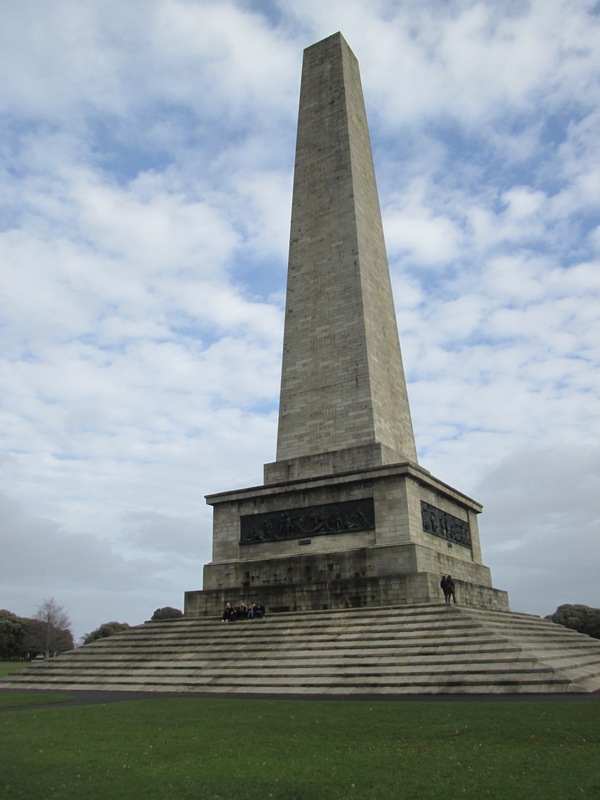 I skirt the Wellington Monument, its plinth gained by sloping steps and today occupied by happy loving couples taking in the view, being kings of their castle. Wellington Road branches left off Chesterfield and descends towards the Islandbridge Gate. Exactly a century on from the Invincibles outrage, Malcolm McArthur, an effete, financially straightened socialite, hatched a convoluted plot to stage a solo armed robbery. Determined to steal a car, in July 1982 he loitered in the woodland nearby. He identified a target, a young nurse, Bridie Gargan, who parked her car and left it to take the summer sun. it ran one step ahead as we followed in the dance. in love’s hot fevered iron, like a striped pair of pants. The plan was not best laid. MacArthur dragged her to the car and violently assaulted her, driving out of the park with her dying in the back seat. His escape took him towards James’s Street Hospital where, bizarrely, an ambulance, its driver thinking MacArthur was a doctor with a patient, escorted him through the grounds of the Hospital with siren blaring. MacArthur kept going, eventually depositing the car and its victim in Rialto. foaming like a wave on the ground around your knees. and the old men playing checkers by the trees. Days later he murdered farmer Donal Dunne while posing as a purchaser for his shotgun. MacArthur was run to ground in his hideout; the residence of the Attorney General in Dalkey. You couldn’t make this stuff up. John Banville tried with the Book of Evidence but it’s not nearly so bizarre as the fact. The AG, meanwhile, headed off on holiday, it was booked after all. Taoiseach Charles Haughey ordered him home. Haughey’s expression of disbelief resulted in the coining of the acronym, so descriptive of the era, by Conor Cruise O’Brien; GUBU: Grotesque, unprecedented, bizarre and unbelievable. All the sweet green icing flowing down. The Magazine Fort stands guard over Islandbridge Gate. 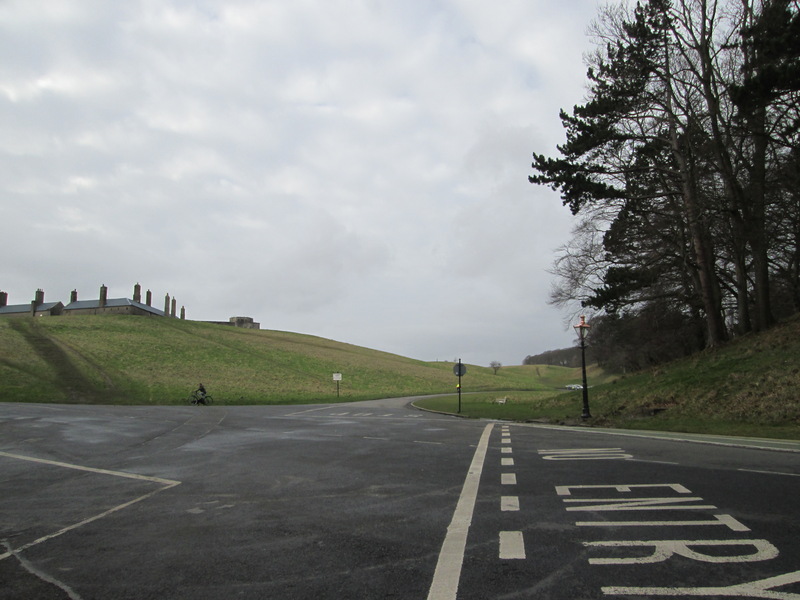 It dates to 1734, a star fort dominating this undulating, lonely south-western section of the Park. It featured in the overture for the 1916 Rising. A group of Volunteers, posing as footballers, gained entry to the fort claiming they needed to retrieve their ball. I have no idea if any were members of Bohemians, but they managed to disarm the guards. However their plan to blow up the fort by way of signalling the onset of the Rising was something of a damp squib. Exiting by the pretty Gate Lodge, a short left takes us to the Liffey bridge. Rising up to the south is the first stretch of the South Circular Road and the second part of our odyssey. Conyngham Road heads east, a short stroll along the southern wall of the Park to the Luas line at Kingsbridge connecting to the city centre. A halfway house, if you like.